We live in times of constant change, new ideas and techniques, in a market where disruption is the norm. We need to keep up with new ways of working and remain competitive, yet we also still need to ensure that we can deliver the basics well and with quality assurance. Many practitioners need good basic practical advice on making ITSM work. Many managers and directors need clarity around the ITSM value proposition and how to drive the right behaviours for ITSM – this session can help with both of these challenges. 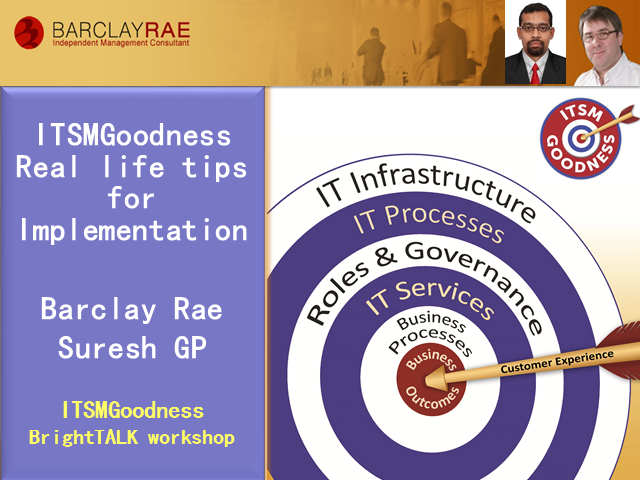 In the first ITSM Goodness webinar of 2015, Barclay Rae and Suresh GP, of TAUB Solutions, discuss practical solutions, ideas and tips to make implementing ITSM a success. This session will focus in particular on successful ways to navigate through the maze of different ITSM standards, methodologies and approaches, including DevOps, SIAM (Service Integration and Management), as well as ITIL, COBIT and others. It will be an interactive session and we will take and encourage questions from the live audience – so be sure to join in and get some great practical advice and ‘how-to’ guidance! IT organizations invest huge amounts of time and money in incident and problem management, but does this really create any value for their customers? In this live video panel, Barclay, Daniel and Stuart will discuss different viewpoints of these two processes, and how they can form part of our overall approach to customer experience. · Are incidents and problems really different things? · Shouldn’t customers expect services to work properly without incidents? · Why do IT departments spend so much time and money on resolving incidents, when customers would rather see investment in new capabilities? ·How does incident management contribute to value creation? · Who should be doing incident management? Is it really something that should be left to the service desk alone? · How can these two processes contribute to customer experience, and why does this make a difference? Service Catalogue and Service Design are essential elements in the success of service management and particularly in the way that this can help to support multi-sourcing, SIAM and Service Integration. This is particularly relevant in terms of clarifying the supply chain and defining the value chain – of IT services. New sourcing models may bring new challenges but many elements of good practical Service Management are highly useful in developing successful sourcing strategies. This presentation highlight key area and practical guidance. There is currently a lot of discussion and buzz around DevOps – an agile approach designed to combine fast technology implementation with Service Management and Operations. Is this a new way of working, a new culture for IT, or is it another marketing re-hash of some established standard approaches? Is this in fact a new way of thinking that combines several silo areas and gets them working and collaborating together? DevOps uses agile thinking and so isn’t completely new, but it does talk a new language that reaches out to a new IT constituency who previously might not have been interested in ITSM. So how does this relate to ITSM Goodness? This session looks at the key elements of DevOps and some of its simple common sense approaches to ‘fast’ ITSM. It also looks at how this applies in practice to organisational change and collaboration – i.e. Steps 6 and 7 of the ITSM Goodness model. The session offers a pragmatic view of how DevOps can be truly useful - instead of just sounding like another piece of marketing hype – in order to achieve success for the mainstream IT and ITSM organisation. How does ITSM Goodness fit in with the ITIL framework? Is it an approach that can be taken without using ITIL or does it require prior knowledge of this? How can ITSM Goodness add value to an ITIL process or toolset implementation ? This session looks at these questions and explores the relationship between ITIL (process and lifecycle) areas and the straightforward approach as defined in the ITSM Goodness 7 Steps. It maps out the areas of overlap and parity, plus some areas where ITSM Goodness is clearly different. Certainly, one key goal of ITSM Goodness is to achieve simplicity and clarity by deconstructing and summarising key elements in ITIL. The ITSM Goodness approach aims to reduce the content and IP associated with ITIL - at the same time it also clearly references some key ITIL processes. ITSM Goodness also covers more of an implementation and transformational approach, including Organisational Change Management. This session will be of value to both the experienced ITIL practitioner and the Devops/Agile/JDI crew alike. ITIL is a registered trademark of Axelos. Using ITSM Goodness as a guide to successful tool implementation. There are many potential obstacles in the way of your projects - their success, and yours, rely on great project management skills and people management as much as on technical or functional capability. Join this session to learn how to leverage key elements of the ITSM Goodness and 7 Steps approach to help you ensure that your projects are set up and delivered successfully. This approach is based on many years of procurement and implementation project experience and provides a wealth of practical guidelines for action. The session also includes a hand-out on ITSM Goodness for tool implementation. What does ‘ITSM Goodness’ actually look like in action? For this final session Barclay reviews the whole ITSM Goodness series and the 7 Step approach with special guest ITSM practitioner Richard Smith, who has ‘been there, done it’ and used this approach to very positive effect. Richard and Barclay will discuss issues and real life outcomes based on Richards’s project which involved service catalogue, a new toolset and a variety of ITSM activities. At the time Richard was Service Desk Manager at Aggregates – he is now Business Improvement Manager there. This will be a lively, practical and informative session, which places ITSM Goodness squarely in the real world and demonstrates how these simple steps deliver positive and successful results. This will be the 8th and final part of this monthly series, which has proved helpful and popular with ITSM practitioners at all levels. ITSM Goodness is an approach created by Barclay Rae to deliver practical, proven, successful and accessible advice and guidance for ITSM and IT professionals. The focus is clear and simple – on achieving the right business outcomes from IT, and how this is delivered, via the Customer Experience. How does an IT service delivery organisation ensure that the right messages are being delivered about what it does and how successful it is? This seventh session puts the focus squarely on marketing and image. These may not be seen as conventional ‘IT’ roles or responsibilities, but they are critical areas that need to be addressed and managed. Most people working in IT didn’t set out to be marketeers, so the guidance here is around how to create powerful messages, deliver these and then check that they are being heard, as well as taking on board feedback received. Many IT organisations do a decent enough job at managing their image and outside perception, but with the ability for many (non-IT) departments and organisations to buy services directly – often without the associated management of risk – ‘decent’ is not good enough. Marketing and image management are now vital elements in the delivery of IT and this session provides some simple practical guidance on how to do this. This 8-part monthly series is designed to provide real-time value to newcomers and take to the next level those already familiar with the approach. What do we mean when we talk about ‘culture change’ – particularly in IT and ITSM? Usually this involves an approach that requires either people or the organisation (or both) to go through some sort of metamorphosis – often this is not possible or easily achievable simply with a few processes and/or a toolset. We can’t expect to change people, especially if in reality this only involves sending out a few emails and communiqués. What kinds of actions contribute to maximum success in this area and how do we go about doing them? OK, so you spend 3 days a month compiling and delivering your operational reports. But does anyone actually read or act upon them? If you stopped producing them would anyone notice? Do your customers get any value from these and do your reports work to support and develop your relationship with them? Although many IT organisations struggle to produce useful reports, the good news is that a high percentage of what is currently collected as operational output is in fact useful information - as part of a compound or ‘bundled’ approach to reporting. This fifth session in the ITSM Goodness series will look at how your current reports can be used as building blocks to achieve greater value both internally within IT and also with your customers. It lays out what sort of reporting can be achieved and how to achieve it in simple, clear terms. Respect is an emotive word, but often this is a major issue for service desks and those people working in them. Often there is a lack of awareness, interaction, and practical respect provided by other people working in the same IT organisation for the Service desk, what it does and what it represents – ie the whole organisation. This is not simply an issue of individual and personal rights (although that is of course highly important -) it means that there is a lack of real co=operation across organisations, often resulting in a poor and un-coordinated response and customer experience. This session identifies some of the reasons behind this issues with practical suggestions of how to tackle them. Problem Management is a game changer. It is critical in developing real quality in service delivery. However, very few organisations actually get this aspect of ITSM working well. This fourth session in the ITSM Goodness series will look at how we spend too much time focussing on efficient ‘fire-fighting’ (Incident Management), rather than looking at avoiding recurrence or eradicating faults altogether - ultimately a better solution for customer and provider alike. Often there are some simple misunderstandings around what Problem Management is or what is required to make it work. Also it can be difficult to find the right people to make Problem Management happen, particularly as it is not a simple linear process that can be ‘industrialised’ like Incident Management. This session provides simple clear guidelines on what is needed and how to make Problem Management work well for your organisation. There’s plenty of talk about ‘Service Catalog’ – what it is and what it does. This session provides clear guidance on how to do it. Service Catalog ultimately is about reaching out and building a realistic set of services in a language that is meaningful to business and IT people alike – the value of this is to create business-based targets that all are agreed on. The difficult task is often finding a useful level at which to define these services in a common language. At heart this can be very simple and might not need to be formally described as a ‘catalog’ – on the other hand there is much to be gained from using the extensive body of knowledge already available in this area. Whatever your approach, this presentation brings together real-life as well as theoretical learning to provide a practical set of guidelines. Make no mistake – your Service Desk is THE focal point and flagship of IT. Regardless of how good your technical resources and capabilities are, the perception of your overall service quality will be highly influenced by your Service Desk. It needs to be supported and invested in – both financially and in terms of management commitment and support. So how can your Service Desk be excellent? This third session in the ITSM Goodness series looks at what makes an excellent Service Desk – what is needed to achieve this, including both internal Service Desk measures and what support is needed from across the whole IT and service delivery organisation. In addition this session identifies exactly what is needed from management in terms of relevant resources and support, in order to enable your Service Desk to fulfill its brief of delivering excellent and efficient customer service. We will also look at what is needed from other teams to support their Service Desk and how the role of Service Desk Manager is key and central to the success of the ITSM operation. It may sound simple to say that we need to define our services, but what do we actually mean by services? - How are our services linked? - Do we include applications and hardware? - Is email a service? - Do we include all aspects of technology in the delivery of a service? When these and many other questions come up, there is still little real practical definition of how to do this (SLM and Service Catalog) in the best practice world. This second session in the ITSM Goodness Series is a straightforward walk-through of how to define your services, how to structure these into a useful format and create a hierarchy that can then be developed into a number of other useful tools, as well as forming the basis of your service delivery and reporting. Many IT people agree that engaging with customers is a good idea and a great goal, but are often disheartened and negative about how to do this - particularly when it is not clear who the best contacts are and also because these people may not be remotely interested in ‘engaging’ with IT. This 8-part series is a new addition to the ITSM Goodness brand and is designed to inform and provide real-time value to both newcomers as well as take ITSM practitioners already familiar with the approach to the next level. In this first webinar Barclay provides practical and proven guidance on how to get initial engagement (even when it may seem impossible). He also demonstrates how to build on this to develop a useful mutual relationship which can define clear criteria for Service Management - e.g. valuable reporting. This session includes advice on what to provide to customers as well as what sort of approach and information gathering is required by the IT organisation. Seriously, do you produce loads of weekly or monthly information and output that nobody reads or does anything with? Many IT Organisations simply churn out loads of week- or month-end listings and reports which only relate to what IT does and not how this supports customers or their business. Why does this happen and what can IT organisations do to improve the relevance and value of their performance metrics? This session looks at what is needed to focus and build appropriate data structure and inputs to ensure that useful and valuable outputs are created and used for improvement. No its not the support service for the local zoo, but this session does take a look at the real (often unspoken) big issues around a service desk, that can determine its quality and success. The session will include recommendations and suggestion on how to tackle these issues and achieve real quality and value for the whole of IT. Barclay Rae has been providing practical and successful consultancy services for IT Service Management since 1994. Barclay delivers ITSM Goodness workshops, programmes, reviews and training services to organisations to get them quickly moving and achieving real success and delivering value from IT. All the content on this channel is dedicated to providing practical, simple and effective advice and guidance on achieving business value from IT services.